Instructions for origami animals are available in a large array of skill levels, ranging from the simple origami cat to a complicated sleeping feline. Cats are a common household pet, making them popular subjects for origami enthusiasts to fold. The cat is often a challenging folding project for many people who like to fold origami figures. However, a cat or kitten face is an easier origami figure than the whole animal. In fact, the head is so simple, even children can make cats using well-written instructions. Tammy Yee has an orange cat that kids print off using their own computer paper. Six steps for folding are all that are needed once the design is printed. Lisa Shea offers a simple video tutorial that creates a cat with a head, body and tail. The folds do not necessarily have to be perfectly aligned in several areas, leaving room for small mistakes without altering the project design. The Origami Resource Center shows how to make a cat out of a dollar bill. The cat features a curved tail and curved ears. Origami-Instructions.com has a quick cat face that comes to life when you draw the features on. Activity Village has instructions and video for making a cat on a broomstick, perfect for Halloween. Fold just the cat if you want to use these instructions year-round. Other than the money origami cat, making the cats using plain origami paper allows you to customize the cat with googley eyes, whiskers and pink triangles for the ears and nose. Folding origami animals and birds is something that most origami enthusiasts want to master after they have perfected simple origami figures. Often, a person finds him or herself enthused with a particular kind of origami, whether it is origami dragon folding or creating cats. If you plan to have a collection of origami cats, move from the simple models above to more intermediate and advanced models. Keep your earlier figures for comparison, to see how far your skills have advanced. Cat's Head Brooch by Nick Robinson offers origami folders a way to make a cat's head, perfect for placing over a group of papers. No written instructions are offered, so folders need to be familiar with reading origami diagrams. Cat Nap at Star Wars Origami is a sleeping cat, first created and diagrammed by Philip Schulz. It takes two pages, so remember to click over to the second page for the final instructions. Stephen O'Hanlon offers instructions for making both a Thin Cat and a Fat Cat. Cat by Herman Van Goubergen is an expert level cat that takes over 60 steps to complete. Some written instructions are included in this PDF. Gato by Roman Diaz is a cat figure, complete with whiskers. The written instructions are in Spanish, but advanced origami folders should be able to follow the diagram. Folding the more difficult origami cats requires more practice than making the simple cat origami. In fact, you may need to attempt to make the advanced cats several times before getting them correct. 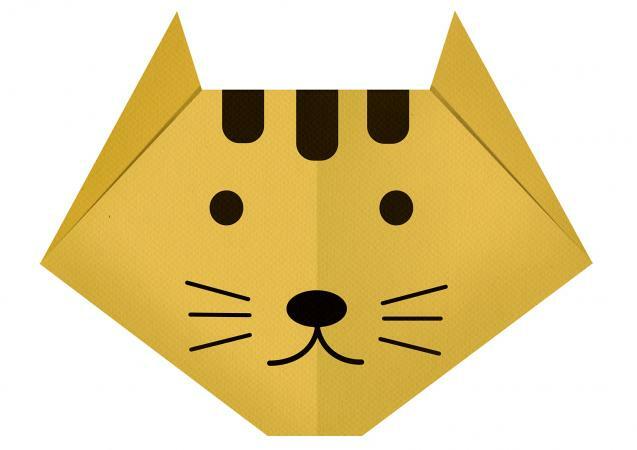 Simple cat origami allows novice folders to practice basic folds and skills. Move on to making difficult cats once you are adept at folding the easiest cat diagrams.